A personal injury claim doesn't always require a direct collision with another vehicle. A motorcyclist who lays down his bike as an evasive maneuver may still be able to recover damages by filing a personal injury claim. There isn't enough room to swerve to avoid a collision or enough time for proper braking after someone pulls out in front of you. You're traveling on a mountain road, and a crash with a motorist could send you over a very steep cliff. There's an unavoidable object in the road such as a semi-truck trailer that was involved in a previous accident, and you can't swerve around it. The bike has experienced a mechanical failure preventing proper control. It may seem that a motorcycle rider who chooses to lay down his bike is responsible for the injuries that result. However, if this action was in response to the negligent conduct of a motorist or mechanical problems created by the manufacturer of the bike, the motorcyclist may have a valid personal injury claim. To win this type of personal injury claim, you need to establish that laying down the motorcycle is considered a reasonable response to the circumstances. This can be done by producing evidence such as eye witness testimony, photos of the accident scene, surveillance video, and law enforcement reports. In some cases, accident reconstruction experts can provide additional insight as to the cause of the accident. If it's determined that you laid down the motorcycle because you were speeding or following too closely to react in another manner, you might be found partially at fault. In this case, you can still seek compensation for your injuries. However, your settlement will be proportionately reduced to reflect your responsibility for the damages that occurred. 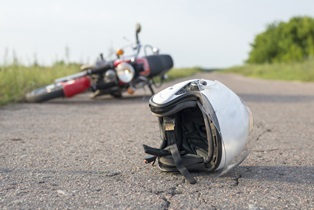 It’s important to note that unless you didn’t suffer a head injury in the accident, not wearing a helmet in accordance with Louisiana's motorcycle helmet law may contribute to your being found partially at fault. All expenses must be correctly documented. Medical expenses can be proven by providing copies of bills and invoices from healthcare providers. Lost wages can be proven with pay stubs or a statement from your employer. Anticipated future medical expenses and loss of future earning potential are established with expert testimony. Pain and suffering compensation is generally calculated by multiplying actual damages by a number that reflects the severity of your injuries. Typically, Louisiana's statute of limitations for filing a personal injury claim related to motorcycle accident injuries is one year from the date of the accident. However, evidence can become more difficult to locate as time passes. Therefore, it's in your best interests to begin the process as soon as possible. Our motorcycle accident injury attorneys work on a contingency fee basis, which means there is no upfront cost for representation. Your attorney will establish liability, document damages, and negotiate a settlement on your behalf, so you are free to focus on recovering from your injuries.